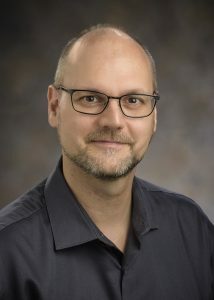 Pascal Hitzler, endowed NCR distinguished professor in the Department of Computer Science and Engineering, was named the 2018 Brage Golding Distinguished Professor of Research for his dedication and pioneering work in research. Hitzler’s research surrounds the Semantic Web. His Data Semantics (DaSe) Laboratory attracts top students from all over the world, including students from 10 countries, as well as a diverse mix of domestic students, including women, minorities and students with disabilities. Throughout his career, Hitzler has authored or co-authored over 450 publications. Since joining Wright State, he has authored or co-authored 250 publications, including 41 journal articles, four books and 50 refereed conference papers. His work has over 9,000 citations, making him one of the most cited authors at Wright State. The American Library Association Choice Magazine named one of Hitzler’s textbooks an “Outstanding Academic Title” in 2010. He is also the founder and editor-in-chief of the Semantic Web journal, which is ranked as the leading journal in its field. Hitzler has a deep interest in quality education. He has received multiple teaching innovation grants to develop new methods to teach theoretical computer science. He created a new discrete structure sequence in the Department of Computer Science and Engineering that has been instrumental in increasing access to computer science for students who lack mathematical preparation. This sequence has increased retention rates exponentially. In 2018, Hitzler organized the First U.S. Semantic Technologies Symposium at Wright State, attracting more than 120 top researchers to the university. “Dr. Hitzler is an international leader in the field of Semantic Web, in research, teaching and application. He is an exceptional member of our college’s faculty,” said Brian Rigling, interim dean of the College of Engineering and Computer Science. Hitzler’s work has been featured in Science Magazine. He has encouraged several undergraduate and graduate students to assist him in his studies. For example, many of his publications have students as co-authors. In addition, Ph.D. students are involved in proposal preparation, and his graduate students attend conferences all over the world.